All it takes is just one pass with this powerful hydraulic attachment to a mini-loader, and you've fully tilled and and prepared a yard or garden surface for planting. 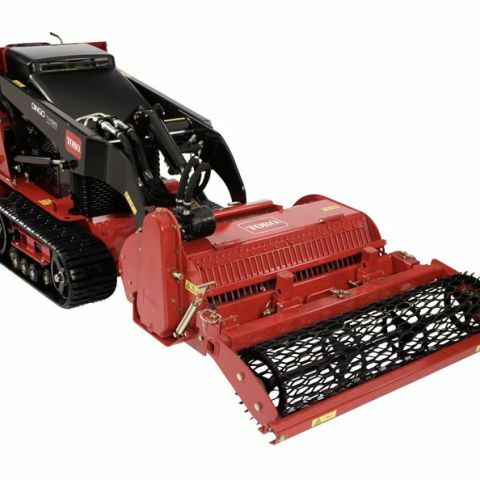 Imagine a super-rototiller with ten times the weight and heft of a large garden tiller -- and you have the soil cultivator attachment rental for compact track loaders like the Dingo or Bobcat MT. Covering a 36-inch path with hydraulically driven tines and roller, with one pass this attachment fully tills soil to 5 1/2 inches deep, then rolls the surface to prepare for sod or seeding. Or, there's no better way to blend in amendments, fertilizer or compost into the soil -- just lay the materials on the surface, then mix into the soil with one pass of the cultivator. In minutes, this cultivator attachment can transform rough terrain into a perfect planting bed. Hydraulic power from compact loader at a flow of 7 to 14 gallons per minute.